Born in Lorain, Ohio, on April 18, 1962, Mr Dittmer graduated from The Ohio State University (B.A. 1984), and Capital University Law School (J.D. 1984). He is admitted to practice in Ohio and the US District Court for the Southern District of Ohio. A former bailiff and staff attorney in the Franklin County Common Pleas Court, Mr. Dittmer focuses his practice on civil and criminal litigation, including the prosecution of personal injury, products liability and wrongful death claims. Mr. Dittmer's experience in criminal defense law includes all aspects of misdemeanors and felonies - including white collar and business crime. 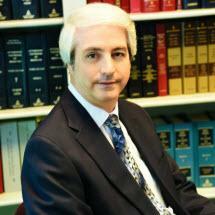 He represents both individuals and businesses in his civil and criminal practice. As a trial attorney, he has tried many jury and bench trials to verdict throughout the state of Ohio. He has also presented oral arguments before the 5th and 10th District Courts of Appeals. Trustee of Hampsted Village Homeowners Association. Counsel to dozens of homeowner and condominium associations throughout Central Ohio. Member of the Columbus Bar Association Admissions Committee. Obtained $4 million jury verdict as co-counsel in a medical malpractice case for physician's failure to properly diagnose stomach cancer. Obtained $4.3 million settlement of a product liability claim against a major automobile manufacturer. Obtained $1.3 million jury verdict in a premises liability claim later set aside when motion for judgment notwithstanding the verdict was granted by the trial court. Obtained $1 million settlement for plaintiff who suffered traumatic brain injury in automobile accident. Obtained $250,000 settlement for plaintiff who suffered mild traumatic brain injury in automobile accident. Obtained $150,000 settlement for minor plaintiff who lost finger in ATV accident. Successfully defended a liquor control/police officer in an 11-count theft in office prosecution in state court, who was found not guilty on all counts. Successfully defended two Delaware County corporations against claims of intentional tort and negligence for the death of an employee after the trial court granted summary judgment in favor of both corporations. Mularski, Bonham, Dittmer, Phillips & Steele, LLC serves clients throughout Central Ohio, including Franklin, Delaware, Licking, Fairfield, Madison, Pickaway and Union Counties.